The story of Shut Up, Tim really starts all the way back to my 21st birthday. I was handed a bottle of Behemoth from 3 Floyd’s and immediately fell in love with Barleywine. I love everything about the style: the booziness, the complexity, the inch and a half of neck beard that instantly grows the second you finish a bomber by yourself. In a world loaded with milkshake cake batter IPAs, and left Twix vs right Twix brownie batter pastry stouts, Barleywine is everything beer can and should be. Now flash forward to September of 2017. I started on at Karben4 by stacking cases on bottling days and stacking grain on Mondays, with only a little light wall destruction and corner scrubbing to fill in the gaps. By the end of that year, I was given the opportunity to join the K4 family full-time. When the January employee party rolled around, I was looking forward to my first opportunity on our 1bbl pilot system. It was during that dark, unspoken party that Shut Up, Tim was born. 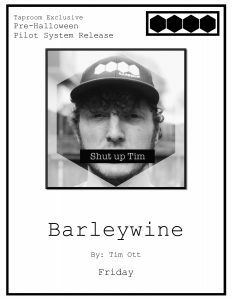 In between rounds of fruitless beer pong against the two better looking K4 owners, which hurt my pride and eventually my Uber rating, I asked if I could tie up a pilot fermenter for a month to create a proper barleywine. I was told yes and also that I should put it in this awesome tiny barrel for as long as I wanted, so we brewed the beer. I say “we” because this was my first professional batch so I had the oversight of my fellow K4 brewer Kyle Cooper to help make sure I put the dip tube in the mash tun before filling it to the brim. If you have ever dreamed about writing a beer recipe and brewing it yourself and then selling it to people, it really is as badass as your favorite brewers make it seem. After it fermented, we split the batch into a barrel and a keg to condition for several months. The kegged non-barrel-aged version was released in the taproom last fall. However the beer we put in the barrel was just a tiny bit too special for this world. That’s why we brewed 2 more turns on the pilot system. These I did by myself on my day off and it took 12 hours because of the extended boil times. Trust me when I say that I’d do that again in a heartbeat for this beer. We laid those batches down in a Heaven Hill barrel to get the same beauty rest as the previous batch before being released at this killer Anniversary party. 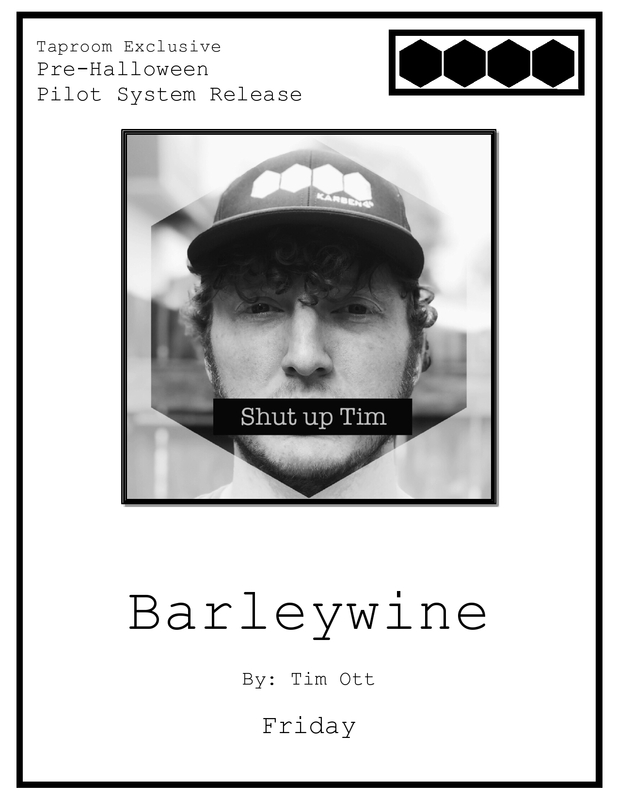 So there you go, the story of how I made a beer that is good. You should come try if for no other reason than to get the beautiful hug on the inside that comes from drinking Barleywine. Barleywine is love. Barleywine is life. Oh and the beer is named after a common response in the brewery to carefully crafted, albeit innately sarcastic witticisms I put out almost constantly.